In Our Gym Bags...2019 Edition! 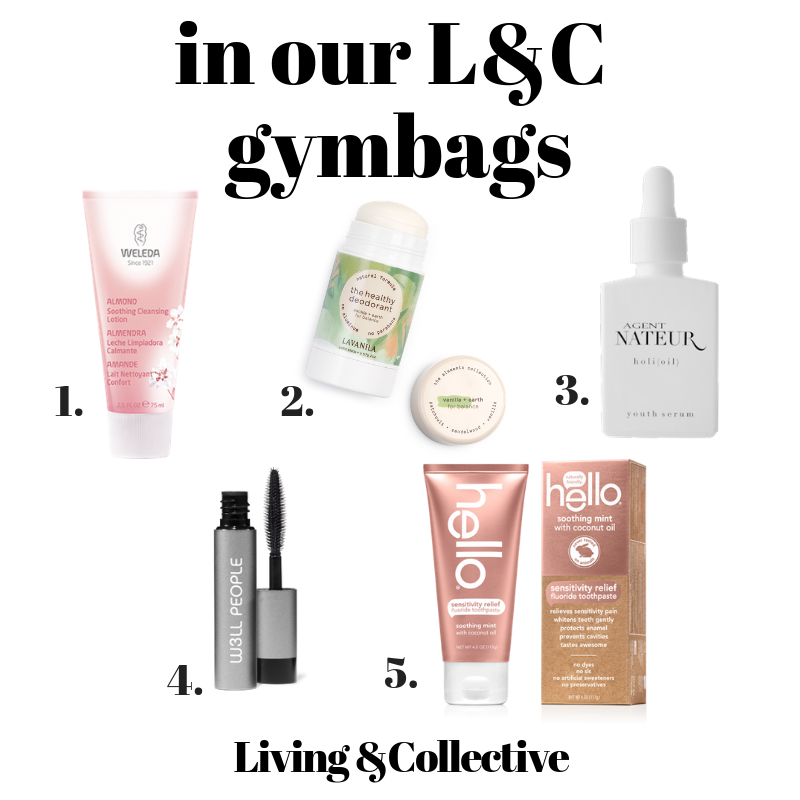 Whether your dusting off your gym bag or jumping right back into your daily routine, this time of year we really get inspired to hit the gym & we have a few of our favorite essentials to keep in your gym bag! Weleda Almond Soothing Cleansing Lotion: Washing off the sweat is key to keeping a healthy complexion & we love this all natural cleanser from Weleda. Its gentle & soothing & has a light almond scent that smells amazing. Lavanila Vanilla + Earth Deodorant: We are always on the hunt for natural deodorants that work, & Lavanila is a brand that is tried & true. The Vanilla + Earth is a soft natural scent & Lavanila rolls on smooth without the gritty texture of a lot of natural deodorants. Great for sensitive skin. Agent Nateur Holi Oil: This oil is a bit of an investment but worth every penny. Not only does it smell like heaven but it is the perfect post-workout treatment for your skin. It leaves your face feeling nourished & naturally glowing—perfect way to highlight all the good feels from your workout! W3ll People Mascara: One of our favorite brands, from right here in Austin, this mascara is all natural & absolutely gorgeous. Our favorite color is black & we love keeping a tube at home & a tube in our gym bag just to freshen up after a workout. W3ll People Mascara is 100% cruelty-free, petroleum-free, paraben-free, gluten-free, coal tar-free, aluminum-free, fiber-free, & clump-free with natural & organic ingredients. We are huge fans. Hello Soothing Mint with Coconut Oil Toothpaste: We love the many healthy benefits of coconut oil & this Hello toothpaste includes the magic ingredient plus fluoride for a delicious, light tasting toothpaste that is the perfect refresher for after a sweat sesh! We love that its natural & not tested on animals ftw! Let us know your favorite gym bag products!! There are so many great ones out there….xo, L&C.